Do you want a screen recorder that helps to record your computer screen online without downloading or installing on your computer? Do you also want to record your computer screen without any limitations, no lag, without watermark and with excellent audio quality? Apowersoft Screen Recorder can Fulfill your needs perfectly. What is Apowersoft Screen Recorder? Apowersoft Free Online Screen Recorder is a lightweight web-based tool which captures your computer screen with high quality. It has an intuitive interface which supports screen recording along with high-quality audio from system and microphone. It is one of the best screen recorders for OS platforms like Windows 7, Windows 8, Windows 8.1 & Windows 10. This software is web-based, and you don’t need to download the software separately. You need to install the launcher, and you’ll get access to software control bar. Also, you can trim the recording and save it to the destination folder. Every youtuber likes to record his screen and show the tutorials to his viewers. This online software will fulfil their requirements by providing handy tools to record their screen easily. Follow the below step to step guide for the detailed tutorial. First of all, go to this Page and click on Start Recording. If you already downloaded the launcher, your recording will start immediately after clicking Start Recording. If you already installed the Launcher, then your recording will start immediately. Otherwise, a speech Popup window will prompt to download the launcher. After installing the launcher, you’ll find all the tools related to recording on your desktop screen. Click on a Red circle with text REC on the lower left corner. A popup will appear asking “Are you ready?” If you’re ready to record your screen, then click ‘Ok’ button. Otherwise, click ‘Back’ button. You can also find “Hotkeys” to help you while recording your screen. Remember them. Now your screen will start recording. You can record your screen without any limits. It gives you quality recordings, unlike other free video recording software. You can add text, paint, colours, arrows, circles, squares while recording your screen. You don’t need to wait until editing. Just click on the pencil icon, and you can see a lot of options over there. You can choose one according to your choice and start adding text or shape to your recording. 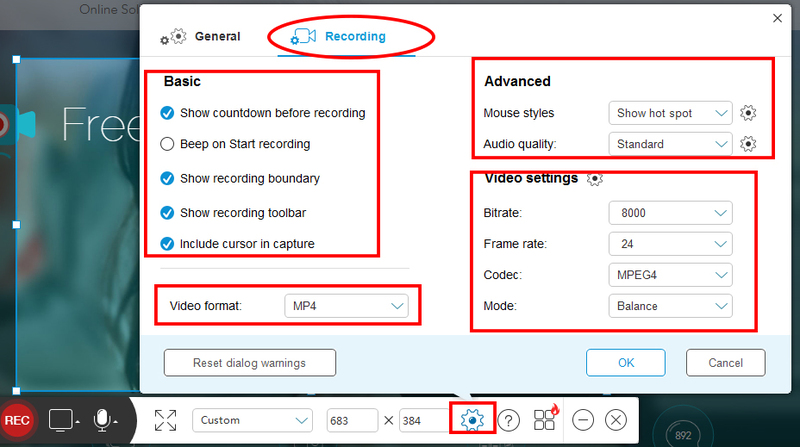 Click on Screen icon and select Screen to record the screen or Select WebCam to record through your Webcam. Click on Mic icon and select the options you want to show while recording. You can also select the screen resolution according to your requirement. You can manage the recording settings by clicking on Gear symbol on the bottom. Enable Keyboard shortcuts and adjust your shortcuts. You can also change default output directory. You can either pause the recording take a break and then continue or stop the record. When you finish clicking on the icon (✔) save the recording or else click on the icon (✖) to start over or delete the recording. If you click on (✖) icon a pop up will ask you to Delete the file or start over the recording. After clicking on (✔) icon, a file will save to your local folder. A preview will appear on your desktop screen. You can verify and click on save option. After clicking n it, various options will appear to edit a video file, Save and share. If you’re not satisfied with the recording, you can just hit the Redo button and re-record the video. You can trim the video right away from the preview and publish it to your favourite place. As shown above, Apowersoft screen recorder is very easy to record professional videos for your tutorials and other useful things. It has rich features to create, edit and share your recording with the audience. Unlike other professional screen recording softwares, you can use this software like a pro without any limitations for free of cost. Hi, I am MBA graduate, Blogger, Digital Marketer, Tech geek and love to share my knowledge with everyone around me. How to solve download pending in play store?